GRAFENWOEHR, Germany — As part of the ongoing transformation of military commands and units at U.S. Army Garrison Bavaria, an Area Development Plan Workshop was held here Oct. 22-26. 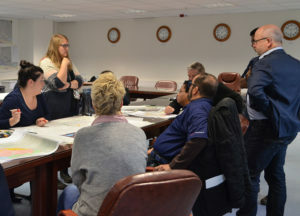 The workshop, led by the USAG Bavaria Directorate of Public Works, focused on development issues and project impacts over the next 20 years for the Tower Barracks East District. The Tower Barracks East District includes the buildings and areas east of Wilbur Road and south of Gettysburg Avenue, as well as the 7th Army Training Command Headquarters area. The East District includes buildings housing offices of vehicle registration, vehicle inspection, self-help and other public works facilities, as well as many other garrison services. To build more synergy across like-minded units and services, representatives from AAFES, 405th Army Field Support Brigade Base Support Operations, the Logistics Readiness Center, the Directorate of Public Works, the 7th ATC Combined Arms Training Center and 1st Squadron, 91st Cavalry Regiment participated in the week-long workshop. The participants conducted a site tour of Tower Barracks East during the first day of the workshop. The rest of the week consisted of discussing and analyzing alternatives, and developing a preferred plan broken into phases. “We’re shaping an infrastructure of commonalities to enhance production and performance,” said James Charette, Logistics Readiness Center operations officer. The workshop comes on the heels of announced growth at Tower Barracks. With all the changes that are happening in U.S. Army Europe, we want to be as flexible as possible in our plans, added Tasker. He also noted that these plans support USAG Bavaria as a power projection platform. According to a Sept. 7, 2018, USAREUR press release, new unit activations across Europe are scheduled to begin this year and should be completed by September 2020. The new units to be stationed at Grafenwoehr include a field artillery brigade headquarters, two multiple launch rocket system battalions, and additional supporting units. The addition of these forces increases U.S Army readiness in Europe and ensures better response to any crisis. 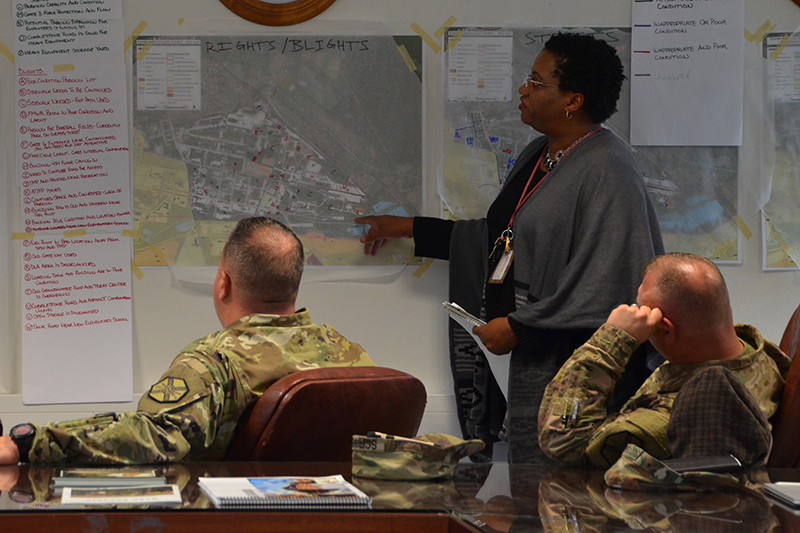 The initial plan generated from this workshop will guide future growth, focus on future capacity and utilize existing assets within the U.S. Army Garrison Bavaria footprint. “We will go through two more iterations of draft plans and then a final plan that we ultimately will brief during the Real Property Planning Board to the community for their buy-in,” said Tasker.